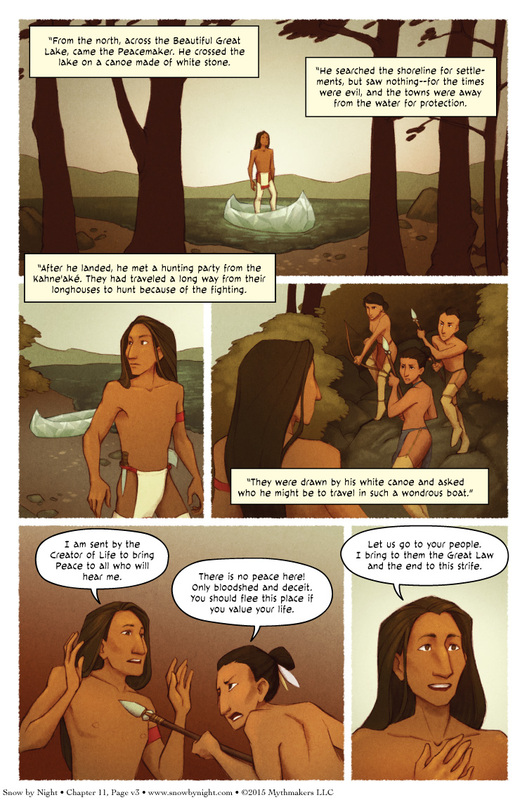 Here’s Page 3 of The Peacemaker and the Tree of War. My apologies for it being a little later than normal. We’re still trying to get ahead of the schedule. Kristin is feeling much better. Just in time to draw page 4. A lot of things sound a bit like the bible, because the bible sounds a bit like a lot of other things older than it. A single “creator of life”, monotheism… often cultures would feel multiple gods and complexity like god A killed god B and used body to make X life. Peace being good thing from creator… many cultures had gods who fought wars with each other and warriors were good, men of fame, heroes. This sort of story for example would not easily come from norse/viking culture, roman, greek, etc. The peace was really an alliance between 5 (or later 6) tribes, but they still made war with tribes outside their alliance, including over fur trade with white man. The Liranequois are not monotheistic. Instead, they see their creator as one spirit among many. The Creator of Life is one of the children of the Sky Woman who is the daughter of the Great Spirit who fell to earth through a whole in the sky. The Oneida Nation has an excellent retelling of this story on their site. Now was this tale influenced by Jesuit missionaries? While it is possible, Joseph Campbell raised the theory of comparative mythology. Christianity is not the only religion that has virgin births, and a messenger of the gods that brings instructions is a common motif. In the end, I decided to draw from the Haundenosaunee legend as they currently tell it. Granted this part is not a part of Deganawidah’s song but I thought it fit. Very cool. Thank you for linking this.